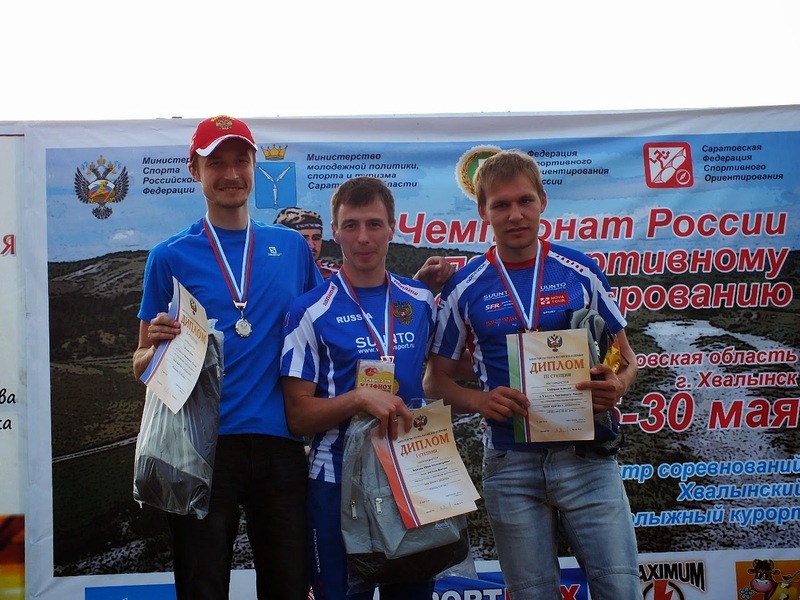 Orienteering blog about competitions and trainings by Denis Grishman, russian national team runner. The season of 2016 is over now for most of the runners and it’s quite a common thing to have some flashbacks. I have not been updating my blog for couple of years, waiting for an urge to do that. After coming up with the story (in Russian) about Rus.orienteering champ last week I feel like my inspiration for writing and sharing something with others about my o-experiences isn’t yet done. Summarising my races from 2016 I came to a conclusion that I have to make up some ground for all the unwritten stories during last couple of years. There is one thing which bothers and strikes orienteerers the most – time loss, better known as mistake. I sorted out some of my cruelest misses of a year with an attempt to analyse what were the reasons behind them. To provide you a true entertainment I made it in a popular format of mistakes parade, countdown places from 10 to 1 with commentary. Именно эти слова, вынесенные в заголовок, изрек один знакомый европеец, когда услышал про Чемпионат России по спортивному ориентированию в Крыму. С вашего позволения, на этом геополитические вопросы я отложу в сторону и перейду к гораздо более интересному предмету! Мой отъезд на заключительный в сезоне 2016 года Чемпионат России совпал по времени с начавшейся в Карелии зимой. Может быть поэтому я садился в вагон поезда с чувством ненавязчивой радости. Главными целями моего прибытия в Алушту за 5 дней до начала Чемпионата были отдых и акклиматизация. Поселившись в центре соревнований с видом на море и горы, я незамедлительно приступил к их реализации: много гулял по набережной, хорошо питался, делал по одной легкой тренировке в день и сходил в баню. Дни пролетели незаметно и вот уже в коридорах гостиницы и по пути в столовую можно встретить такие до боли знакомые лица ориентировщиков. Воздух в день заезда основной массы спортсменов прогрелся до +20С, и это окончательно позволило всем забыть об оставленных на севере сугробах и валенках. Первым днем в программе Чемпионата значился лонг на местности, известной под названием Эльх-Кая. Для абсолютного большинства российской элиты местность эта (как и местность остальных дней) никаких секретов в себе не таила. У всех за спиной минимум по 2-3 сбора и множество тренировок в Алуште. Пожалуй, можно ждать сюрпризов в результатах уже в первый день? Сюрприз состоялся только в том, что Леня Новиков выиграл на 77 минутах бега у А.Храмова целых 6 минут. При мысли, почему же я опять не готов так, как Леонид в этот день, немного взгрустнулось…Интересно, что у женщин на лонге Настя Рудная с ошибкой на 8.5 минут на первом кп сумела завоевать бронзу. На следующий день участников ждала двухэтапная эстафета в живописных окрестностях Демерджи. Для меня это был первый из дней отдыха на соревнованиях, в который я принял бодрящие ванны на Черном море. 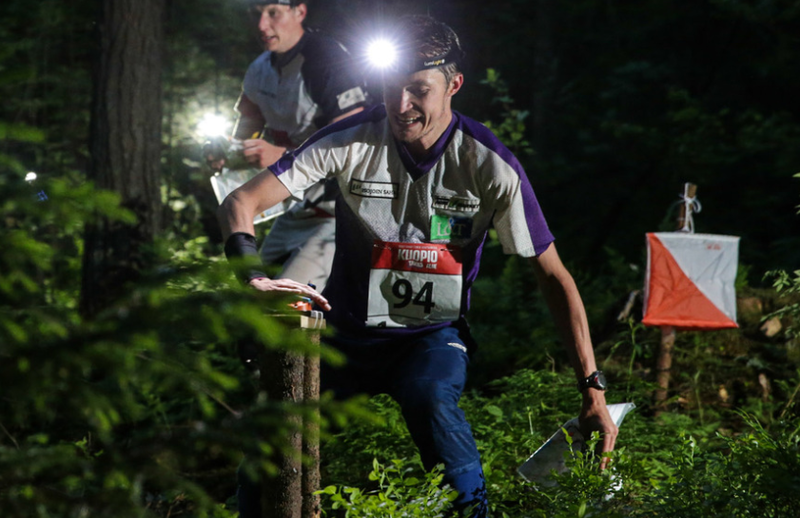 Before coming to enjoy cool Finnish summer in the north I had a busy June tightly packed with all kinds of orienteering races. Kuopio-Jukola was another enchanting experience and another lesson on how to achieve maximum result out of low capacity. An annoying flu I had been going through for couple of weeks right before Jukola completely nailed me to the ground and made my long-time dream of having terrific solo night-show in 1st leg impossible. Nevertheless, proceeding smoothly through the race I gradually got to position 5 right before arena passage. Tiredness and my only miss on a whole course of 40 seconds three controls away from finish were reasons enough for giving about 10 places back. Rasti-Kurikka’s final placement in Kuopio-Jukola was 105th.Scrolling down through different o-blogs after Jukola I was glad to notice that for many runners this event stands alone with it’s unique atmosphere of main orienteering feast. Living same emotions with thousands of people is great, isn’t it? This story was initially supposed to narrate of my proud and happiness being qualified to my first ever World Champ..., but no, it didn’t happen and I won’t be running in Italy this summer. Since my first Tiomila in 2001 I’d gone through many occasions on different legs which are worth to remember. Probably the strongest memories of all are still kept from 2010, then after great runs made by my teammates from Tampereen Pyrintö I started out on 9th leg in the lead, with Kalevan Rasti and SK Halden at my back. That year we ended up 4th. But currently (or finally? )in 2014 I’m not hunting for any relay glory and just helping my modest club to do their best. For the first time in my life I was running 10-Mila in a team which consisted of 2 different clubs: Rasti-Kurikka and Ylistaron Kilpa-Veljet, 50/50. Our try a week earlier in FinnSpring-relay with Tapio run 1st leg and me 2nd had proved reasonable and was welcomed again. According to 10-mila leaflet 2nd leg this year almost completely belonged to daytime and required no extra-light. But while warming-up I had noticed that barely everyone in the area had headlamp! “Wow,really?! Maybe they know something I don’t?” In quite a hurry I had found our coaches and after brief discussion put a small light on my head. Felling of security is still prevailing in our sport! Tapio run a cool race and arrived to exchange gates right on schedule. This time that meant +4.51 and position 125. 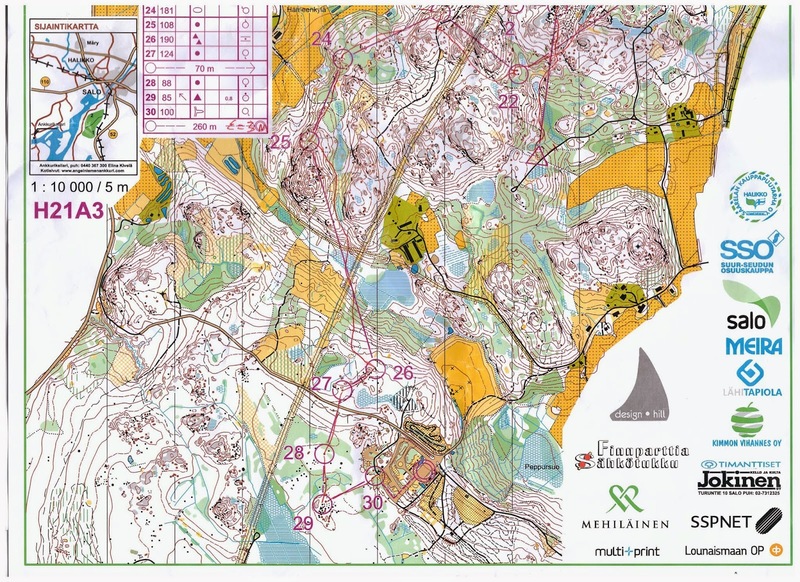 Check out my routes from FS - a major finnish orienteering season opener, which this time took place on a very nice terrains close to the city of Salo. On Saturday I got no place in men's E class( most likely because of late entry), so was warming up in one of A classes. 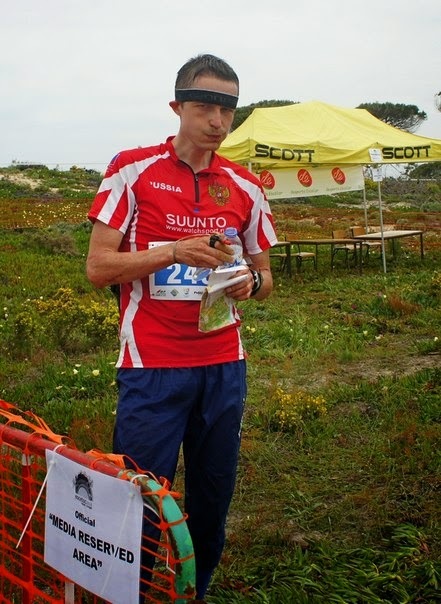 I really enjoyed the real orienteering after being completly bored by EOC fast terrains! Though EOC-2014 now rather belong to history some of it's vivid moments will long time be remembered by many. No doubt that Portuguese o-circus is the funniest and most entertaining I've ever been to! The circumstances we have witnessed during EOC are of such extraordinary character that I now truly believe organizing team was unfortunate victim of witchcraft. Somehow I'm sure all persons in charge will take all needed steps and measures to find out key reasons that stood behind the organizing collapse of EOC-2014 in Portugal. For us, who were running at EOC, there are plenty of data to analize apart from things initiated by bad "magic". My personal dreams and hopes prior this champ were something different from what it turned out to be in the end. Quite low physical capacity during EOC week never allowed me to spread my wings. In this "never-as-easy-before" terrain I was constantly pushing myself to the limit (and probably over it) still being slow compared to the best. I must confess this is a hard feeling for an ambitious runner. Denis Grishman. Watermark theme. Powered by Blogger.